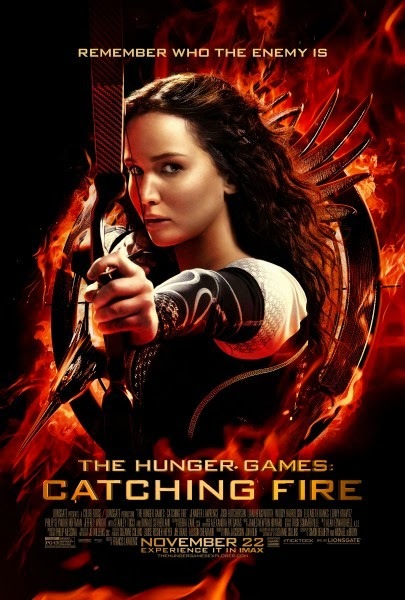 The Hunger Games: Catching Fire is one of the movie that I can't wait to see this year. That's why with fiery spirit, last weekend I watch it in the cinema. Most show was sold out! Wow! This movie is pretty popular here in Indonesia. So, is this movie live up to expectation? I would tell you my opinion about it! Have I ever told you that I'm a fan of Jennifer Lawrence? Honestly, for me Catching Fire is a gloomy movie. Of course it is, since war is brewing in Panem. In this movie Katniss Everdeen (Jennifer Lawrence) was having Post-Traumatic Stress Disorder due to her experience in The Hunger Games. She didn't realize that her act against the will of Capitol would spark rebellions in 12 districts of Panem and she would serve as a symbol of rebellion. She experience sad and terrifying things, hence the tone of this movie become somber. Being the 2nd part of a trilogy is problematic because it neither had the advantage of starting the story nor finish it. So it generally become the weakest in the trilogy. Well, maybe except The Empire Strikes Back. Speaking of Star Wars, I don't know why many 2nd part of trilogy movies fells like it try to follow the path of The Empire Strikes Back. Catching Fire is not an exception, which mean this 2nd film is darker than the first film, with cliffhanger and unsatisfied ending. Why almost second part of a trilogy that I saw follow the “darker before it gets lighter” mentality? But I must say that I love Catching Fire and the first movie equally. I would say things that I love from this movie first. The production design and the CGI is good. They do a good job in create Panem. The costumes are good and beautiful. The acting is good. Jennifer Lawrence bring the frail side of Katniss Everdeen perfectly. And she's really cool with the way she use her bow and arrow. Stanley Tucci as Caesar and Elizabeth Banks as Effie are scene stealers. The addition of Phillip Seymor Hoffman, Jena Malone and Sam Claflin as Plutarch Heavensbee, Johanna Mason and Finnick Odair are refreshing. The things that I don't really like are the movie score and some story telling. It doesn't really show how Katniss's feeling shift from Gale to Peeta. I think Katniss-Peeta's love story lack its deep in this movie. Overall, I think Catching Fire is a good movie and I enjoy it. I even would say that this movie is better than the book. But my opinion might be biased because I only read the translated book in Bahasa Indonesia. Sometimes when a book is translated to another language it lost some feelings or nuances because the translated version fails to relay it properly. That's my opinion. How about you?